Suspension Bridge VS Big Tree: Bridge Wins! The cable-locking system held up as did all the stringers. We can’t see the other end of the main cable but assume it is also okay. Just nothing there to hold it up anymore! Since the creek is still too high/freezing cold to cross, we can’t easily assess all the damage. But the bridge is “hanging in there” until help can arrive. Hopefully our spring won’t need any maintenance in the meantime. Once we cut away the mess, we’ll need to dig out the old post (three feet), get another post across the creek and in place, tamped in with gravel, and then all the hardware re-attached. The decking will have to be removed so the structure can be lifted up more easily. As for the dead man, we’ll have to find out how it fared the blow. You can see the tree that did the deed just uphill from the bridge. Nice aim, tree! Ah well, it was time to replace the decking anyway. We’re looking for metal paneling of some kind (that we can afford). I’ll post photos of the fix later in the spring! Onward. P.S. : We’re getting too old for this sh*t.
We were delighted to finally receive photos of a suspension bridge that was inspired by our book, Building a Small Cable Suspension Bridge With the Cable Locking System. According to the builder, Mo Goldman, the bridge is just under 40′ feet in length and 4′ wide (basically half the length of our bridge) and is located in Virginia just outside of Charlottesville. The posts are aluminum, 13′ in length, 6″ round with 1/4″ thick side walls, easy for two guys to carry. The post holes are 3′ deep and about 2′ around; the posts are placed on a concrete footer prior to pouring around them. Everything was hand-dug and poured because they were limited to access with a Polaris on one side. 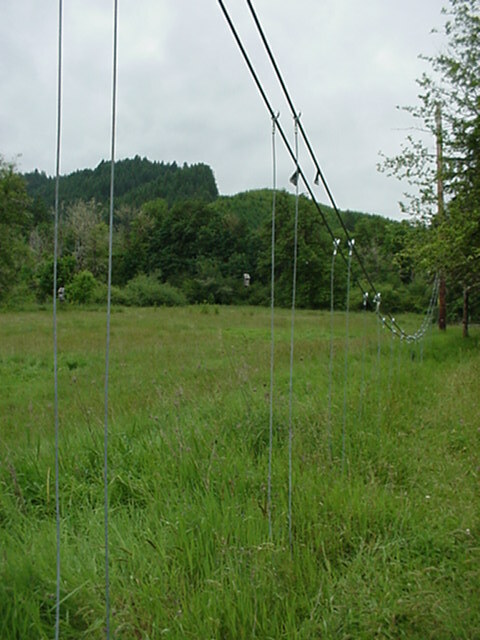 Mo also followed the idea of setting up the catenary curve between two trees/structures located away from the creek to plan and build the cables and stringers on dry ground. Mo didn’t use our cable-locking system, but instead used a system often used for this type bridge – an appropriate length “eye” bolt placed in a drilled hole in the beam. The suspenders were then connected with a chain connecting link, which uses a threaded portion mating to a free spinning nut to open or close it. He wrote to us about the bounce in his bridge which was more than he expected, though not a big deal. I noticed that he paid attention to harmonic resonance in the arrangement of the stringers so they were assumed off the “nodes,” so wondered if the decking material he used could be partly responsible (a suspension bridge is going to bounce, that’s a given). He used a material called Trex, which is a deck material made from recycled plastic and wood fiber. Trex tends to flex more than standard lumber does. We concluded that he needed to stiffen the deck, so now he is working on some ideas. Mo even put up a sign on his bridge similar to ours and inspired us to remake our sign so that it names the creek, too. We hope others who build a bridge based on what we did will also send us photos and notes about their building experience. Meanwhile our book is available in paperback and as an ebook via Amazon.com. Off and on we receive requests for the cable locking system (CLS); either the parts or for dimensions. As we have stated before, we could not produce/have manufactured, store and handle/ship the parts at a reasonable cost to the buyer, so we do not provide them for sale. While all of this information is in the book or in previous blogs, we thought we would try to break down the method for sizing of the CLS so interested bridge builders could use the information to have their parts manufactured close to home. Refer to the drawing below to picture the description that follows. The main body of the CLS was made from a section of rectangular steel tube of 4″ X 5″ outside diameter, the section being 1-3/4″ wide. The wall thickness was .17 of 1 inch, which is very close to 3/16″. The interior was therefore close to 3-5/8″ by 4-5/8″, which fits nicely with a 4X4 (nominal) piece of lumber. So that defines the main body of the device. [After my project, I now would recommend using a 4″ X 6″ tube for the extra room for maneuvering the cable during assembly.] There is a locking plate that fits inside of the main body. It is also .17 of an inch (3/16″) and is sized to fit just inside, at 3-9/16″. The location of the keyhole is placed in this method: the keyhole is composed of a large hole with a smaller slot. If you picture the end of that slot as a hole of the dimension of the suspending cable, that hole would be placed in the exact center of one of the 4″ ends of the rectangular tube, the remaining keyhole would point towards one of the tube’s edges. The locking plate is treated similarly. The dimensions for the keyhole are determined by making them slightly larger than the materials passing through. Since the suspending cable is 3/16″ the hole was enlarged by 1/32″, thus the hole was drilled at 7/32″. For the large end of the keyhole the dimension of the stop was the guiding size. The aluminum cable stops once crimped on measured 1/2″, which is enlarged by 1/16″ to allow for easy passage of the stop through both plates of metal. So that hole is drilled at 9/16″. There is nothing imperative about these drilled dimensions. If you use different materials than you adjust the holes accordingly. For the inverse CLS, [picture in your mind] you simply need to cut off the bottom half of the 4X5 steel tube section. You now have essentially a section of steel C channel of 4″ width, with 2 1/2″ flanges. Now mirror-image this remaining half. You should have it placed beneath the 4X4 beam, cradling it. This changes the CLS from a tension device to a compression device, but the plates function in the same manner as before. All sizing remains the same. What does change is that you have to drill a 5/8″ hole (insert an anti-corrosion vinyl tube in hole) in the 4X4 beam so the suspending cable can pass through to access the inverse CLS. As we have said before, you may freely use this information to build your own bridge or your friend’s bridge. But if you want to mass produce these parts please contact us regarding licensing. Images, diagrams, and text copyright 2018 by Marvin Denmark unless otherwise noted. Please do not copy and post my content anywhere without my permission. Thank you. As mentioned, we built this bridge and wrote a “how we did it” book about the process a few years ago. Recently, I thought it would be fun to share the basics of this design as an Instructable for people who have enough skill to be able to take the information and work with it. And as we do in our book, we recommend having your specific design approved by an engineer just to be on the safe side. I entered their “Outdoor” contest and you can kindly vote if you like by clicking the little vote button at the top of the instructable page. Thanks! I need a t-shirt. UPDATE: Thank you for your votes – were a winner! We won a t-shirt and a waycool Campstove 2 from BioLite Energy! One of the hazards of building a bridge in the woods is that there are trees in the woods. And trees sometimes fall. It was only a couple of weeks after my bridge was completed that a tree fell on it. It bounced off without causing damage other than a dent in a deck board. A couple of years ago during a flood, a tree next to the bridge came down, and while not actually falling on the bridge, parts leaned heavily on the suspension cable. I cut off the branches that were in our way and let the rest stay for now since I was busy with other projects. This spring I finally cut the rest of the tree that was affecting the bridge cable. I knew that the deck had sagged a bit and would need to be adjusted at some point. That’s why I have turnbuckles installed on all the deadman-to-post cable connections as shown in my book, Building a Small Cable Suspension Bridge. I could just turn them to pull the posts back and level out the deck again. I used what was handy to provide a resistance (something to work against) to turning the turnbuckle – in this case a big stick and a metal pipe. WD40 oil worked to loosen up the connections. They weren’t rusty having been protected under the cover of those white tubes all these years, but they didn’t want to break loose easily. I used a small bar for turning, but a longer one could have made things easier. I used a pencil mark to verify if I was tightening or loosening. Once they broke loose, each turnbuckle turned easily. Jeep seemed amused that one side was now lower than the other. But that’s just part of the process! I worked on all four turnbuckles, using line of sight to achieve the results I wanted. All done, until the next tree takes a dive into the creek and the bridge is in its way. This all only took about 30 minutes. Here’s a movie of the process if you’ve never seen a turnbuckle in action. Images, diagrams, and text copyright 2013-2017 by Marvin Denmark unless otherwise noted. Please do not copy and post my content anywhere without my permission. Thank you. What’s that green stuff? People, including house inspectors, don’t like to see anything green on house siding, decking or roofing. As we learned last year, even the FHA has a hissy fit over the color green, and will demand eradication, cleaning and painting, even if the green stuff is not damaging anything. In our case, our 35-year-old house’s cedar siding had a few areas with tiny little hairy lichens happily blowing in the breeze along with a few patches of algae. There were no signs of damage after three and a half decades. But even though the FHA regulations clearly stated that cedar siding was exempt from the rules regarding wood siding, we still had to provide the funds to pressure-wash and stain the house before we could sell it. The deed was done and the sale went through. 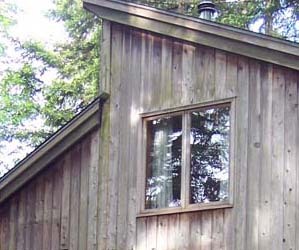 We just hope they were careful, as pressure-washing can be much harder on cedar siding than any amount of lichen. Lichens are a “plantlike” hybrid of fungus and algae that grow all over the world. The self-sufficient stuff can flourish anywhere as long as it gets a little bit of moisture on occasion. It doesn’t retain much of that moisture and it doesn’t take root, making it easy to remove and control. Lichens don’t bother trees and shrubs unless their growth blocks light to the leaves. But people freak out about lichens anyway. Moss, on the other hand, is a real plant, and even though anything green growing on a roof is often called moss, this is the real bad guy. Mosses are generally found in shady, wet places. That’s why we see mosses in the woods, especially in wetter climates such as western Oregon. We also see them on roofs, decks, and other structures where debris and water can collect and provide a foothold for it to grow and spread. Mosses break down whatever they attach to, providing a surface cover and moist soil environment for other plants. It’s great stuff, but not if it’s chomping on your house or your bridge! 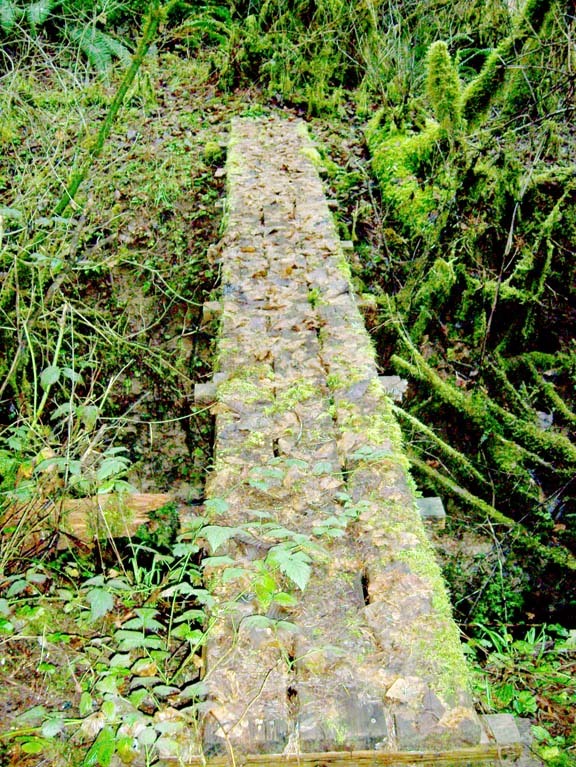 This is one of our small trail bridges, in sad need of a good cleaning. It is obviously located deep in the woods, and is victim to leaves, fir needles, vines, sticks, and of course, moss. My spousal unit came up with an easy way to clean the leaves and other debris that collect on all our bridges. A long-handled squeegee for washing windows makes quick work of the task. 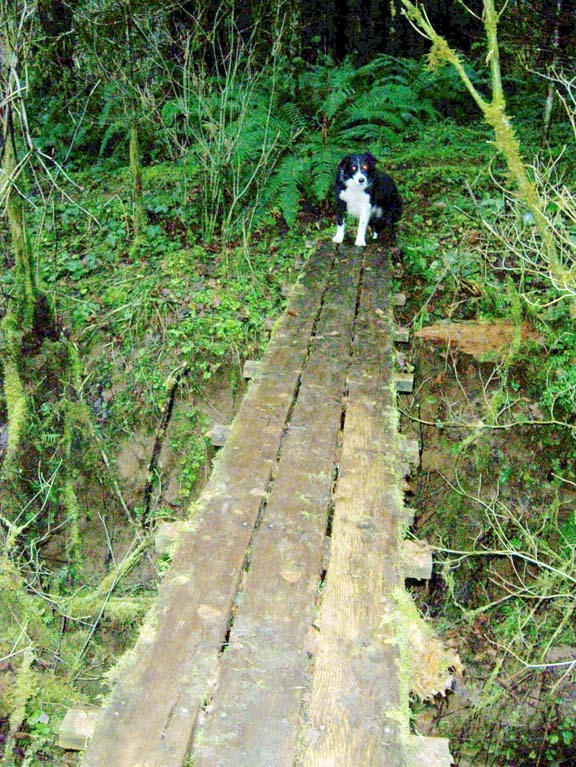 But alas, this bridge decking has been adopted by moss mostly because of our neglect. For now, we plan to carefully chip the rest of the green stuff away with a knife, as the decking appears to be secure enough for another year or two anyway. 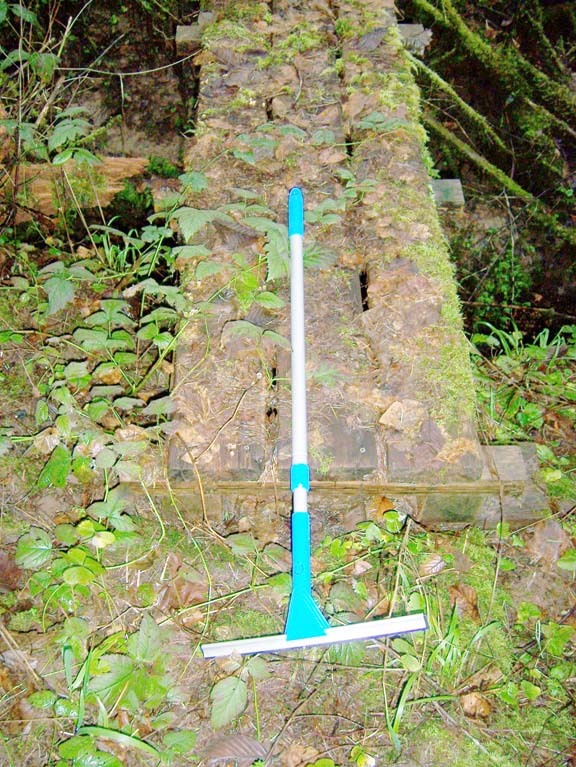 The under-structure is pressure-treated and so far oblivious to the spongy, green, wood sucking plant. Lichen would have been welcome! Images, diagrams, and text copyright 2015 by Marvin Denmark unless otherwise noted. Please do not copy and post my content anywhere without my permission. Thank you. I’m not exactly someone who keeps a formal journal, but I keep a lot of records. They are for reference or just as a way to look back and remember what I did that day, that month, that year. One of the many helpful advantages of digital photography is the ability to take and store photographic records. It’s easy and virtually free, once you have the device, to document and store the process for any project. Publishing the book Building a Small Cable Suspension Bridge was an afterthought after I finished building my bridge, but luckily my spousal unit had recorded most of the steps, using our first digital camera. That old beast used 3-1/2 inch floppy disks (remember those?) and the photos were low resolution. But with some computer magic, we had enough photos to chronicle the steps I used to construct the bridge. Many photos were taken just for fun and our own life journal, but others were for reference. Since my first bridge was a “Golden Gate” style suspension bridge, the stringers were of varying lengths with obvious repeats on each side. 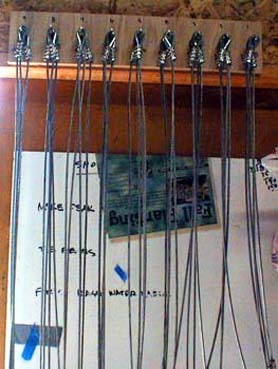 I installed the connection “eyes” to the stringers and organized them using a numbering system. That way, when I attached them to the two main cables, it was an easy chore to sort and install, using cable clamps. I assembled everything on dry land. Then I just attached the two cables (with stringers attached) to the four posts. I could then easily install the cable locking system components and the decking. My more recent project is our house. I put in a lot of blocking so that there were plenty of places to connect cabinets, towel racks, grab bars, whatever. Then I photographed all the walls before covering them. That way, when it was time to hang cabinets, I referred back to the photos to recall just where I put the blocking. 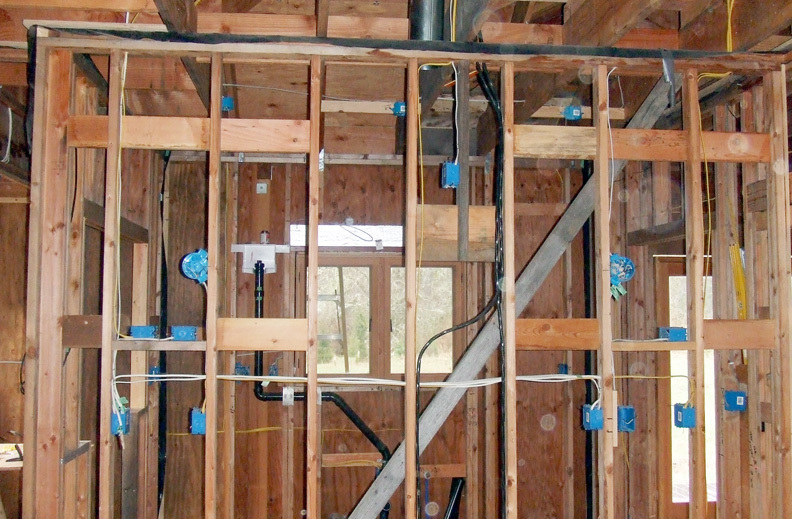 This photo shows the backside of the kitchen wall with blocking for the cabinets. My only regret was that I didn’t write exactly how far the blocks were from the ceiling or floor – large lettering would be easy to read in a photo – but I was able to locate them pretty accurately using my electrical boxes for reference. Images, diagrams, and text copyright 2013-2014 by Marvin Denmark unless otherwise noted. Please do not copy and post my content anywhere without my permission. Thank you.